Pittsburgh’s Downtown Peregrines: Where to see them? Question: Where should I look to see peregrine falcons in Downtown Pittsburgh? Answer: The Downtown peregrines spend time at the Gulf Tower throughout the year but don’t necessarily use the site for their nest. They nested at Gulf from 1991-2011 and again in 2014 and 2017. Uptown: When the peregrines are at the Gulf Tower they are usually visible on the falconcam. 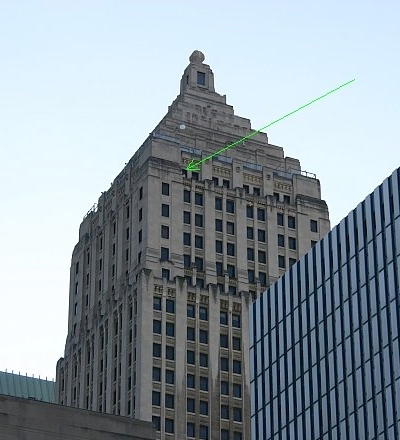 To see them from the ground, look in the area indicated above on the north face of the Gulf Tower. The best place to stand is at the railroad station (Penn Station) or the Greyhound station parking garage roof. 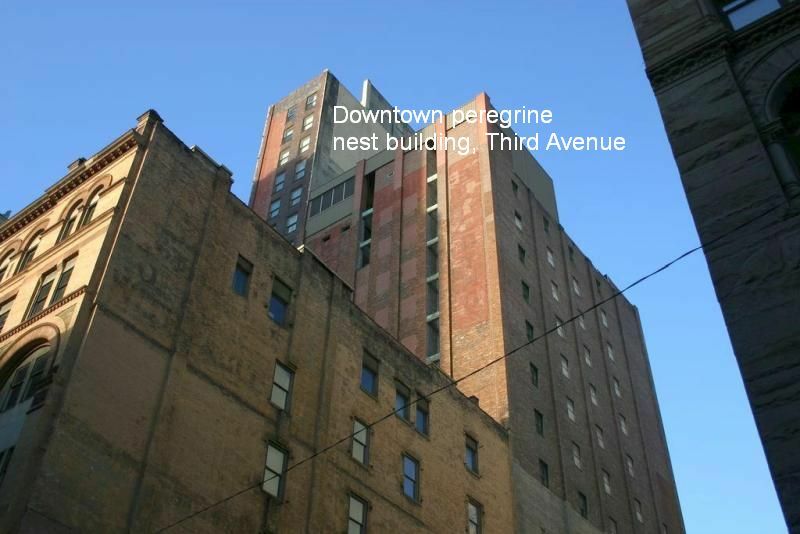 Downtown: In five years from 2012 to 2018 the peregrines nested at other Downtown sites. In 2015 they chose a nook at the old Macy’s department store. In 2012, 2013, 2016 and 2018 they chose an air shaft on Third Avenue. Which direction does that side of the building face? I thought I read somewhere that it faced north, but I’m not sure. I am going to try to get there for the fledge watch, but I am in Greensburg and commit to exact times or days. Jean, The side you want to watch is the one that faces the Strip District and is visible from Liberty at 16th Street (if you happened to be standing back that far… but you won’t be). I hung around the Pennsylvanian for awhile last year. Never saw anything, but nobody bothered me or asked me to leave! It would be nice to bring a chair, but maybe too conspicuous!